NASA Goddard Space Flight Center has awarded the Technology and Integrated Discipline Engineering Services (TIDES) contract to Trident Vantage Systems, LLC (TVS). TVS is a joint venture between Vantage Systems and Trident, Inc. The 5 Year, $114M contract will provide engineering and related services to the Mission Engineering and Systems Analysis Division at NASA Goddard for the formulation, design, development, fabrication, integration, testing, verification and operations of guidance, navigation and control space flight and ground system hardware and software. For further information on the award click here to see the official NASA announcement: http://www.nasa.gov/press-release/nasa-awards-technology-integrated-discipline-engineering-services-contract. TVS will start execution of the TIDES contract following a 45-day phase-in period. Further information regarding phase-in and contract startup activities will be posted soon to the TVS website. Please look for updates at the TVS website: www.trivansys.com. VPL was an associate sponsor of the 4th Annual Northeast Ohio Sjogren’s Walkabout on May 30, 2015 at the Oak Grove Picnic Area in the Brecksville Reservation of Cleveland Metroparks. The Sjogren’s Walkabout is a national event focused on increasing awareness about Sjogren’s while helping to raise money to support Sjogren’s research and education. The goal this year was to exceed the amount of $10,000 that was raised last year. On June 19, 2015 VPL participated in the NASA Glenn Research Center’s (GRC) Lewis Little Folks (LLF) 15th Annual Benefit Golf Outing. LLF was organized in 1985 and is located on the grounds of GRC. It includes not only a daycare center, but also a comprehensive , full-day kindergarten, which is open to all GRC employees and support service contractors. Proceeds from this year’s event went toward replacement of aging toddler playground equipment which is expected to cost $15,000. VPL has supported this event for the past 3 years. 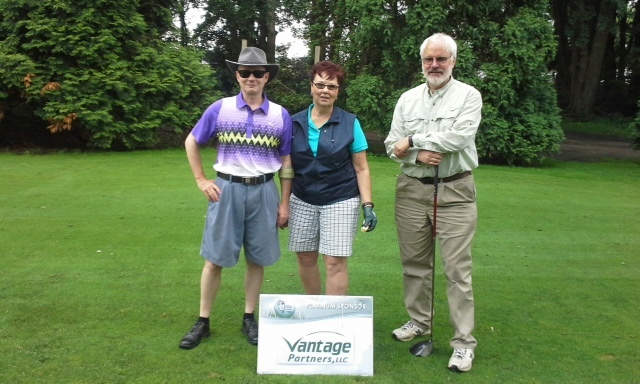 VPL employees supporting the event were Scott Lawyer, Barbara Wamsley, and Ray Kaliszewski. This year VPL is a sponsor of the INCOSE Great Lakes Regional Conference (GLRC) 2015. The conference will be held October 23rd, 24th, and 25th at the Crowne Plaza South in Independence, Ohio. This year’s conference is hosted by the local INCOSE group, the Cleveland-Northern Ohio chapter with participation from other Great Lakes chapters. Attendance at this event will include NASA GRC engineers and management as well as representatives from other industries and government agencies. VPL is a silver sponsor of this event. Click on the following link for more information on this event: http://www.incose.org/ChaptersGroups/Chapters/ChapterSites/cleveland-northern-ohio/chapter-events/glrc9. 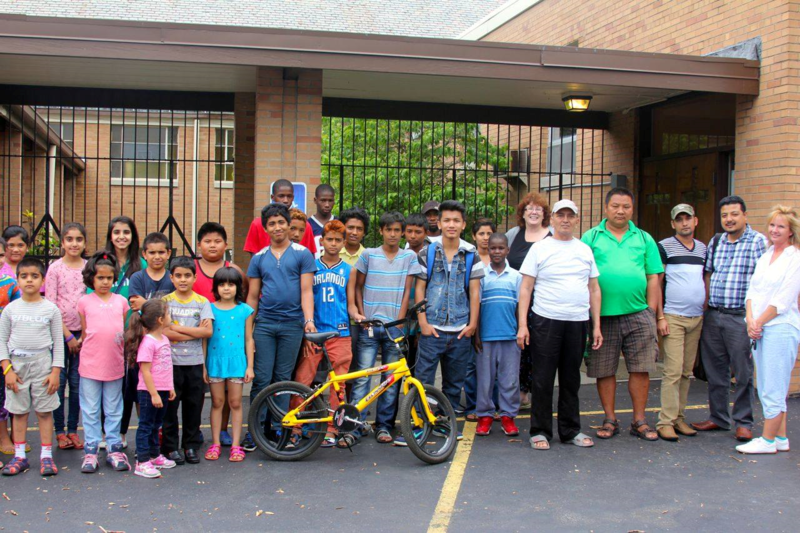 On Wednesday, July 15, at the Hope Center in West Park, 40 bicycles previously and privately owned by NASA Glenn employees and contractors were distributed by Marilyn Groff (pictured far right) to Cleveland-area refugee families from Senegal, Bhutan, and Nepal. In addition to being fun for the children, these donated bikes are much appreciated and needed by the adults, as it provides them with a means of transportation to and from work. This is the third summer Glenn employees and contractors have donatedbicycles to this cause. Over 180 privately-owned bikes have been collected by Marilyn and given away so far. Eric Clemons, Vantage Partners (VPL) employee and Program Director of VPL’s GESS-3 contract at the NASA Glenn Research Center (GRC) has been selected to receive the NASA Exceptional Public Service Medal. The NASA Exceptional Public Service Medal is one of the highest awards in the Agency and represents acknowledgement of significant contributions to NASA's mission and purpose. This prestigious NASA medal is awarded to non-Government individuals for sustained performance that embodies multiple contributions on NASA projects, programs, or initiatives. Official presentation of the award will be at a GRC awards presentation scheduled for August 14, 2015. Congratulations to Eric on achieving this great honor! Vanatage Partners is pleased to announce its selection as the Glenn Research Center's Small Business Prime Contractor of the Year for FY 2014. Effective leadership and employee commitment to customer and corporate goals. Technical work is always on schedule, ensuring that program milestones are met. We achieved significant cost savings; we realized $2 million for the fiscal year. Our documented contract underrun was 1 to 2 percent. Effective reporting and communications: contract 533s and supplemental reports are always complete and on time (often early). VPL’s culture drives us to work continuously to implement efficient and innovative solutions. We coauthored Ohio’s first-ever space plan." 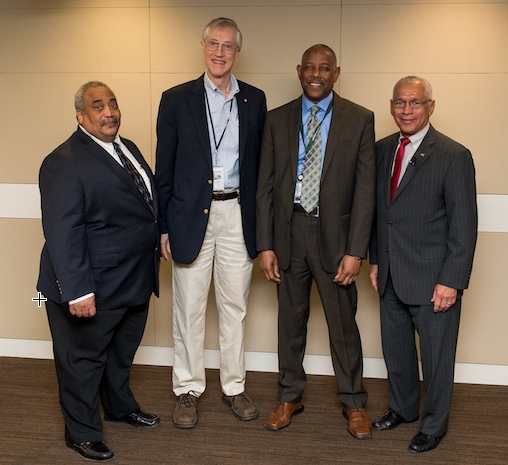 Picture (from left to right): Glenn Delgado, John Mather, Joe Polk, and Administrator Charlie Bolden. Vantage Systems President and CEO, Joe Polk participated as an invited guest in the third NASA Industry Forum (NIF) held on March 10-11 at NASA Headquarters in Washington, DC. The NIF is the brainchild of Glenn Delgado, NASA Associate Administrator for the Office of Small Business Programs. It is an agency-wide endeavor to share center-level information that is of concern to NASA and its contractors. The NIF is comprised of contractor representatives from all NASA centers, and includes representatives from both small and other than small businesses. 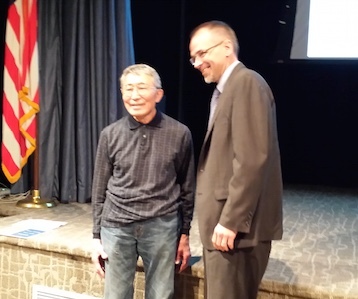 Notable speakers at the Spring-2015 NIF included NASA Administrator Charles Bolden who presented the 2014 NASA Small Business Industry Awards, and Dr. John Mather, 2006 Noble Prize winner and Sr. Project Scientist for the James Webb Space Telescope. 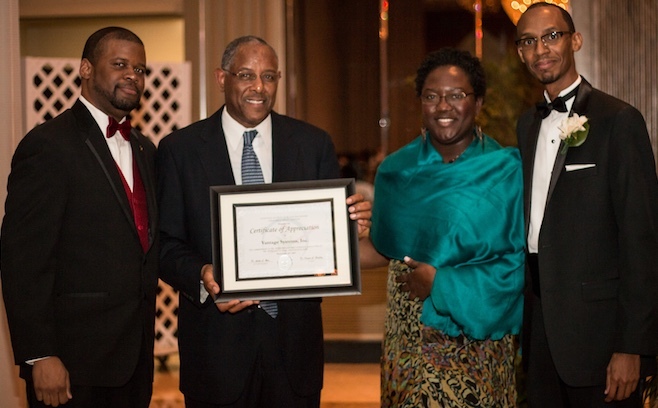 Vantage Systems was one of two companies receiving an award for its sponsorship of the National Society of Black Engineers-Goddard Space Chapter’s (NSBE-GSC) 10-Year Anniversary GALA. The GALA was held on Saturday, November 22, 2014 at Martin’s Crosswinds in Greenbelt, Maryland. Approximately 170 attendees including NASA Goddard professionals, NSBE professionals, and collegiate students gathered to celebrate an evening of reflection, recognition, and rejuvenation. Keynote speaker, Dr. Christyl Johnson (Deputy Director, Goddard Space Flight Center), delivered a motivational and well-received message regarding overcoming fear (False-Evidence-Appearing-Real) in pursuit of one’s dreams. Numerous awards were presented to deserving individuals for their service and dedication to the NSBE mission including a rising young engineer scholarship to a local college student, and a certificate of appreciation to Goddard’s Applied Engineering and Technology Directorate (AETD) for its long-standing support of the GSC chapter, which was accepted by AETD Director Dennis Andrucyk. Vantage is a frequent supporter of NSBE and its mission “to increase the number of culturally responsible black engineers who excel academically, succeed professionally and positively impact the community”. Congratulations NSBE-GSC on 10 years of successful community service!